This is one of the most obvious, yet it is also one of the most frequently overlooked. Changing your oil and oil filter every three thousand miles keeps your engine running smoothly. Not changing your oil and oil filter often enough, on the other hand, can be disastrous: Over time, the additives in your engine oil break down, and the oil becomes thick and sludge-like. 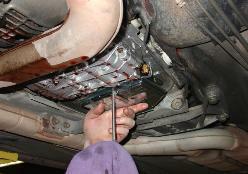 When this happens, the oil creates resistance on the engine, causing buildup and premature wear. Replacing the air filter is another important precaution that many people forget about. We'll make sure you get the correct, high quality replacement filter for your vehicle. A tune-up involves replacing a number of inexpensive, quick-to-wear-out parts, and checking out other more expensive, slower-to-wear-out parts. This should be done once a year to insure that your vehicle delivers the gas mileage, performance and long life it was designed for. Your cooling system is a vital system. It prevents your engine from overheating, which can ruin an entire engine in mere minutes. Your cooling system should be treated with respect, which means flushing your radiator and replacing the coolant every year or so, preferably at the end of summer or fall, before the cold weather hits. Many people don't realize that their automatic transmission contains fluid and a filter that need to be replaced periodically. Unfortunately, neglecting this maintenance repair can result in parts in the transmission failing more quickly than they should, requiring you to overhaul or replace your transmission.